Christian is a happy, kind, thoughtful, and determined 10 year old boy. He has a diagnosis of Cerebral Palsy. His decreased strength and flexibility in his legs have been ongoing challenges that Christian is determined to overcome. 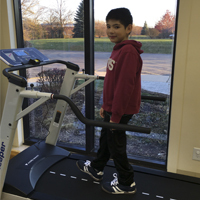 Christian has been receiving physical therapy services with Easterseals ever since he was a young child. Donate Directly to Easterseals Joliet Region - When you give to Easterseals Joliet Region, $0.90 of every dollar is used to provide direct services for children and adults with disabilities. To give, please send your check or money order to Easterseals Joliet Region, 212 Barney Drive, Joliet, IL 60435, or donate online. Donate Online - Now you can donate to Easterseals Joliet Region quickly and securely right on this site! To make an online donation, click the "Donate Online" link on this page. It's that simple! Find out how you can be a member of the Presidents' Council. Create Online Webpage - You can create a webpage and raise funds for Easterseals year round. Donate by Mail - Prefer to donate via postal mail? Download and print a donation form. Tributes and Memorials - Honor someone special while ensuring the continuance of vital programs and services that many people in our communities need. Call 815-730-2052 to make your donation to ensure your gift is processed accordingly. Planned Giving - Planned giving involves integrating a donor's charitable gift into his or her overall financial, tax, and estate planning objectives so as to maximize benefits to both the donor and Easterseals. Contact Deb Strahanoski, Development Manager, at dstrahanoski@joliet.easterseals.com to learn more about how to make a planned gift to Easterseals Joliet Region.